SwitchVPN is a VPN service that requires some thinking before signing up. But once you’re signed up, the product is relatively easy to use and modern-looking. Make sure to read this review thoroughly and see if it’s for you. SwitchVPN is a US-based VPN that started in 2015 and registered in Delaware. We all know about companies located in Delaware – they’re not actually operating from there. Here we’ll evaluate SwitchVPN’s ability to provide privacy and security to users as a US-based company and the consequences of residing in a Five Eyes region. 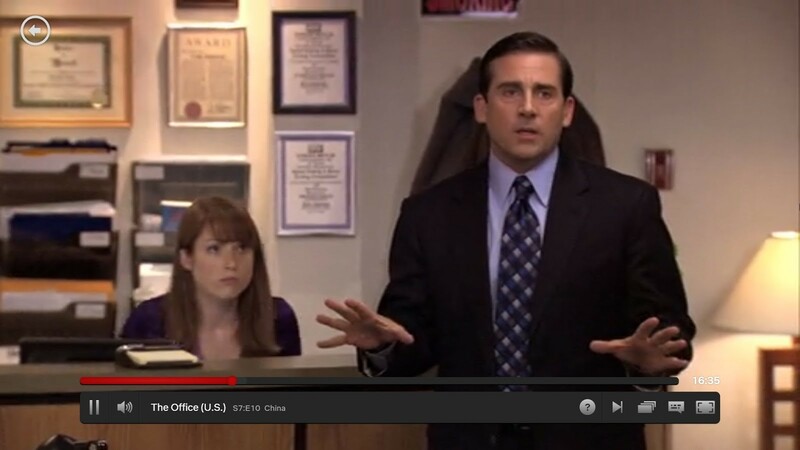 Netflix Test: Perfect for Netflix! We tested Netflix over several regions and it worked each time. For the United States, we chose 3 different cities and all of them worked perfectly. High five for Netflix and chill! Of course, speeds could be a bit better. If fast streaming is what you want, make sure to check out our recommendations for the best VPNs for Netflix. SwitchVPN accepts all kinds of payments. You can pay for your subscription using major credit cards, Bitcoin, PayPal, and Alipay. Device Compatibility: Just about anything works! SwitchVPN’s subscription also comes with the ability to use 5 simultaneous connections across devices. Their Getting Started page lists how to install the service on each device, including setup for specific routers. If you’re able to setup SwitchVPN on your router, this will extend functionality to not only all the devices listed above but also your consoles and smart TVs as well. SwitchVPN has a sleek, modern-looking UI. A big power button in the middle, settings at the top and selected server at the button. SwitchVPN’s UI is intuitive and their use of icons is effective. Even in the options menu, each icon is meaningful and provides a purpose – there’s nothing here that seems superfluous. It’s clear SwitchVPN care about their product and made great efforts to make it a pleasing experience. Server selection is by default set to auto; likely based on location to the nearest server. It’s not clear if SwitchVPN also balances server population, but we’d assume they do for regions that have multiple servers. 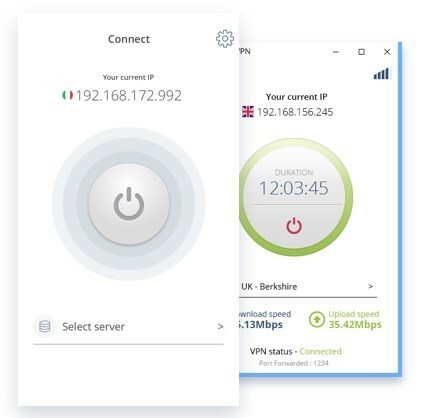 Once connected, users will see their new IP, connection time, download speed, and upload speed. For the server selection, users can view all, recommended and favorites. We were also able to test SwitchVPN on mobile, though this was not quite as easy since it crashed on us… a lot. Their mobile version looks similar to the desktop application and uses the same layout and iconography. For mobile, there are some protocols that aren’t present, though this isn’t uncommon in VPN services that cover both mobile and desktop devices. Intercom is one of the best chat support tools out there and if a VPN provider is using it then you know they’re serious about live chat – SwitchVPN has it. Not only is SwitchVPN’s support responsive, having Intercom allows you to retrieve old conversations automatically. In the rare occasion that support didn’t respond to us instantly, we were given an option to be notified by email when they found time to respond – a nice way to respect customer’s time, and not have them waiting around for help. Refund Policy: Money back, no questions asked! SwitchVPN provides a no-questions-asked, unconditional money back guarantee. The 30-day refund applies to both the monthly and annual subscriptions. Just make sure to email them for the request since there’s no way of doing it through the website. 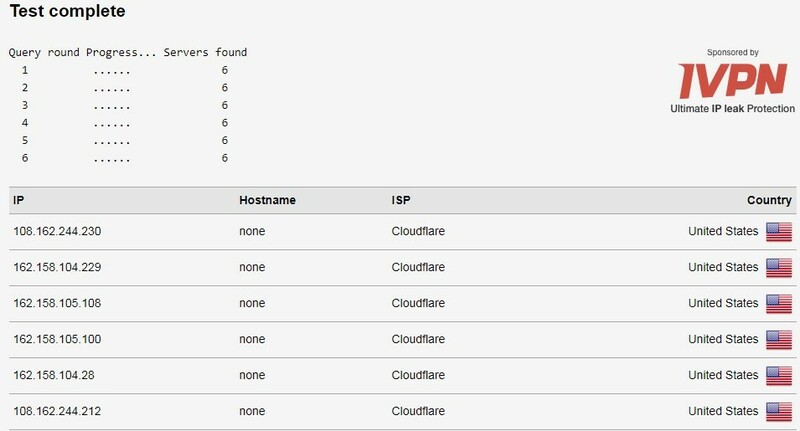 IP and DNS Leak Tests: Leak free! SwitchVPN is leak free. SwitchVPN passed all our tests with flying colors. For proxies, you can also choose HTTP or SOCKS5. That, along with AES-256 bit encryption, ensures user’s security. The default setting is OpenVPN since it’s the most favored protocol; there’s a reason it’s the industry standard. 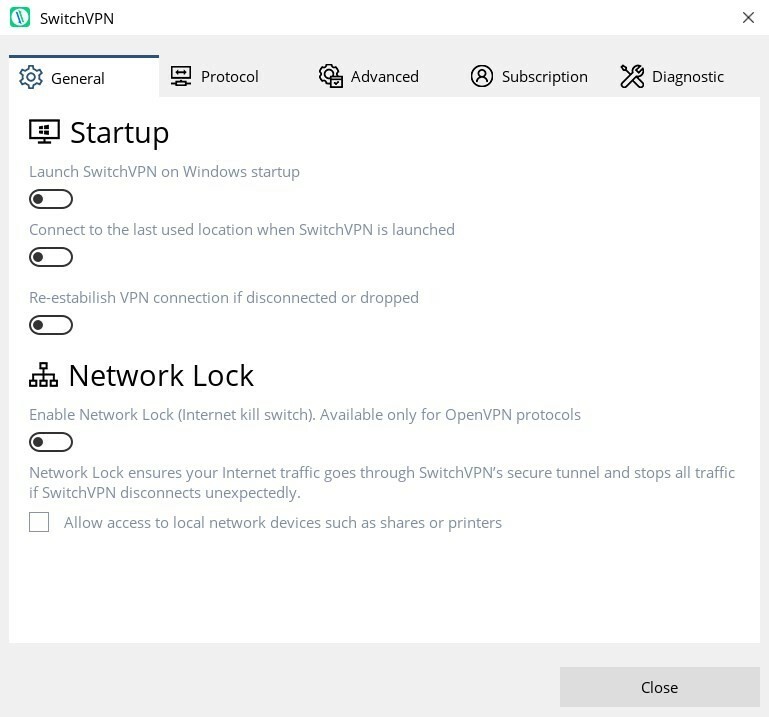 SwitchVPN’s desktop applications have a kill-switch built-in, and they’re working on a kill-switch for the rest of their applications – sweet. SwitchVPN has already broken the 100-server mark, covering 35 countries around the world. SwitchVPN lets users know where they have servers and not how many there are in those regions. It’s quite commendable for SwitchVPN to already have multiple Asia-Pacific servers at this stage. It’s clear they’re trying to cast a wide net of servers for their customers. 145 isn’t a great number, and we’d like to see them increase their server count quickly, but it’s commendable that they’ve gotten so many up and running so quickly. SwitchVPN slowed our connection down as expected. We tested SwitchVPN across the United States, Europe, and Asia. As mentioned above, there’s no server selection in SwitchVPN; rather you can filter by Country and City. This means we don’t know if we’re connecting to the same server each time. We performed speed tests and reconnected after to see if we got consistent results. For the most part, it was consistent; the biggest variance was when connecting to a different city in the United States. Speed tests with SwitchVPN lowered our connection speed anywhere between 20%-40%. It’s quite a range and we don’t believe that we’re connecting to the same server every time. We’ve seen faster VPNs certainly; we’ve also seen slower. Overall SwitchVPN is middle of the road in terms of speed. SwitchVPN allows torrenting on all their servers. This is a big plus, as it prevents overcrowding. The only caveat here is you must use BitTorrent as your file sharing service – limiting but better than no torrenting at all. It’s likely that SwitchVPN is limiting their file-sharing services to make it easier to manage. They also provide instructions to setup port forwarding to BitTorrent – handy. As discussed elsewhere in the review, SwitchVPN’s logging policy is questionable. This extends to their policy on downloading illegal content. One should also note the existence of their DMCA, a requirement of being in the US. 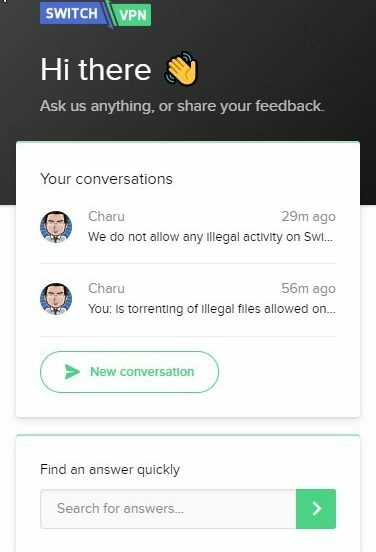 We asked support about this and they said quite explicitly they don’t allow any illegal activity on SwitchVPN. This also coincides with their Terms of Service. This is likely in the event that the government does end up investigating SwitchVPN and they need to cover themselves legally. To find the best VPNs for torrenting, look no further than our top recommendations. SwitchVPN offers two packages, SwitchVPN and SwitchVPN Plus. The difference is the number of devices allowed in the plans. 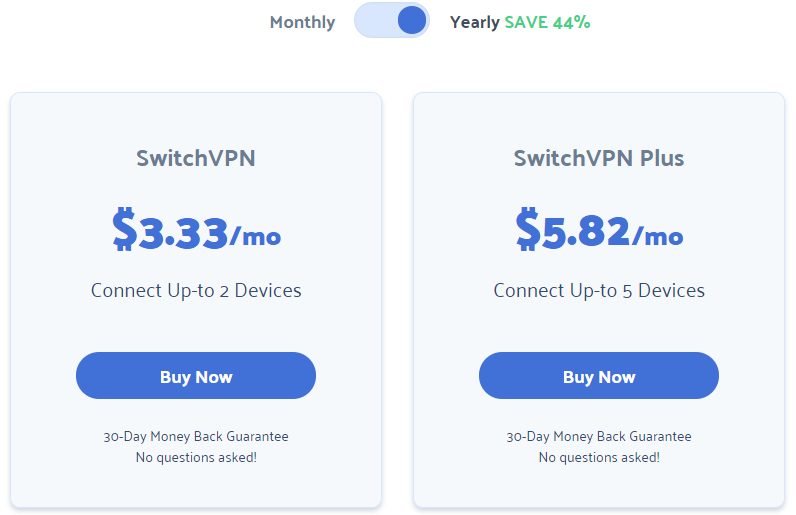 Like numerous other VPN providers, you can pay for the plans in monthly or yearly – where the yearly payments will save 44%; $3.33 per month for SwitchVPN vs. $5.82 per month (on average) for SwitchVPN Plus. The prices aren’t too surprising, they’re not too high or too low considering the device limitations. Sign Up Process: Why are you making this so hard!? Getting set up with SwitchVPN gave us quite the run-around. For starters, there’s no download link or button on the site. The FAQ/help guide is where everything is, including the download links. To our surprise, there’s a “3-day free trial” button there too. It just redirects to SwitchVPN’s pricing section – somewhat confusing, to say the least. Did we actually get 3 extra days in our subscription? No, we didn’t; maybe you have to discover that page first before buying and downloading? We don’t know. They’ve hidden it well. Seems like they need to organize their site a little better to sharpen up the user experience. SwitchVPN’s requirements for sign up are the standard affair. After you’ve entered your payment details, you’re redirected to your user page. The page contains all your subscription details and a system-generated username and password. SwitchVPN allows you to change your password but not your username. This is quite a nuisance from our perspective; if you forget the username that you didn’t create, you have to log in to SwitchVPN’s site to retrieve it. On the other hand, it’s nice for privacy-minded individuals. SwitchVPN has a basic FAQ page. The search function provided is helpful when using generic terms. We feel they were going for the forum type look, but with only 1 contributor and a small collection of topics, this is one of the shorter and less helpful FAQs we’ve encountered. The help page is separate, such that you have to go back to SwitchVPN’s main site to access other links. SwitchVPN claims to not log any traffic or use of its VPN. Whatever data they may collect is for research purposes and does not contain personally identifiable information – so they say. However, since they are a US-based company, they are required to provide personally identifiable information if they have it. Looking further into their ToS, it is clear that some questionable data is still collected. It’s confusing to understand exactly what’s being collected and what for. Users should be wary of this especially if they are likely to engage in any activities that would be considered illegal – we’re looking at you, torrenters! SwitchVPN was founded in 2010 and currently operates under CS Systems, Inc. They are headquartered in the United States. US-based VPNs are always a tricky discussion. Not only are they part of the 5 Eyes and 14 Eyes alliances, but they also have laws that strictly ban file sharing. As mentioned above, this causes SwitchVPN to be somewhat restricted in how liberal they can be when it comes to things like torrenting and similar processes. SwitchVPN offers decent speeds, a great user experience, and the freedom to torrent from any server (even if their stance on torrenting is confusing). Their logging policies and the fact they’re subject to the US government’s requests for information and DMCA policies mean that this VPN isn’t as high up on our VPN recommendation list. We’ve seen VPN providers offer the same things SwitchVPN does, while at the same time offering customers complete anonymity. The purpose of a VPN is to provide security when browsing the web – we’re not 100% confident SwitchVPN does this, and therefore struggle to strongly recommend it to those who wish to protect themselves. There are plenty of VPN services out there; check out our list of top-recommended VPN services to discover the privacy-driven ones if you’re looking for such an option.